So any time I’m cooking up something for dinner that involves plain old rice, I make a double batch. That way I’ll have some leftover rice to make fried rice with later in the week. Another thing homemade fried rice has going for it: flavor variations. Plain old fried rice with soy sauce and garlic is good, but it can get boring. When you make it at home you’ve got all kinds of options on how to season it up! 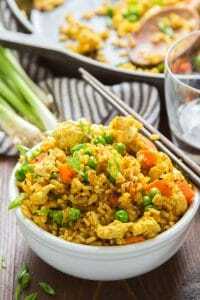 Adding a little curry powder is one of my favorite fried rice variations. 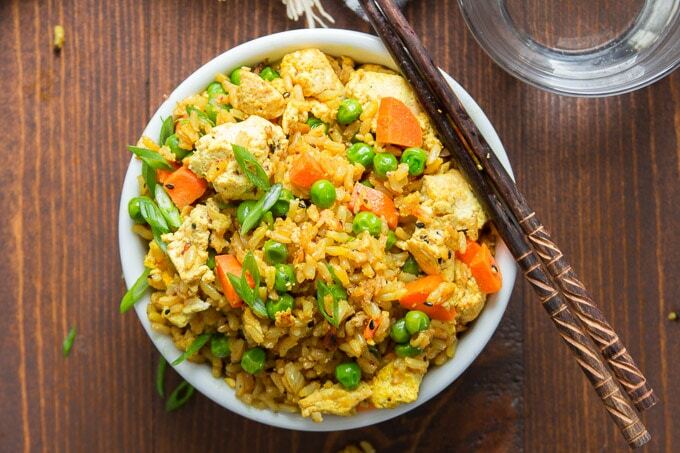 I’m also a big fan of tofu in my fried rice. Most of the time I pan-fry my tofu, but scrambled tofu is extra fun because it mimics the scrambled egg you’d find in conventional fried rice. And when you’re also using curry powder, you get a pretty vibrant yellow color that makes your tofu look like scrambled eggs. 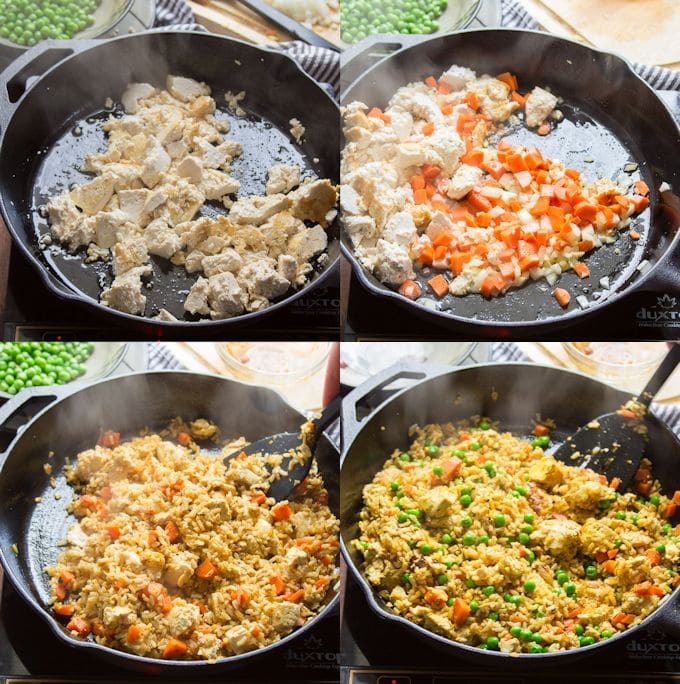 Fried rice comes together very quickly, so it’s really important to prep everything before you start cooking. Mix your sauce, chop your veggies, and measure your rice (but leave the measured rice in the fridge until the minute you’re ready to use it). Heat up some oil in a wok or nonstick skillet. I’m partial to a big cast iron skillet, but a nice wok works great if you’ve got one. 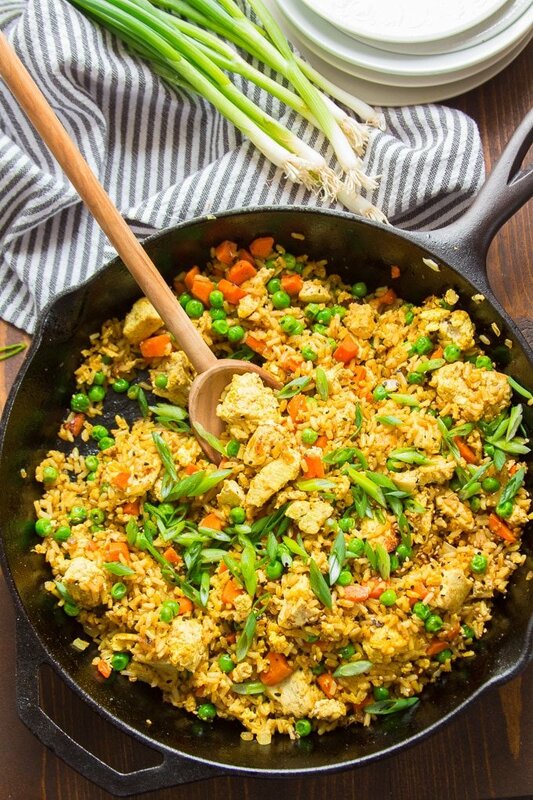 Break your tofu into chunks and add it to the skillet. Keep it in relatively large to medium-sized chunks for now — it’ll get broken up into smaller pieces when it gets mixed in with the rice. Cook your tofu until you start to get some crispy brown spots. Next, push the tofu to the sides of your skillet. Do your best to get it away from the heat source, which may require shifting the pan on the burner a bit. Add some onions and carrots. Cook them over medium high heat until they begin to soften up and you start to see some browning on the onion. Finally, crank up the heat and add your rice and sauce. Stir-fry everything, flipping often with a spatula, until the rice starts to crisp up. Add some peas, then take your skillet off the heat. 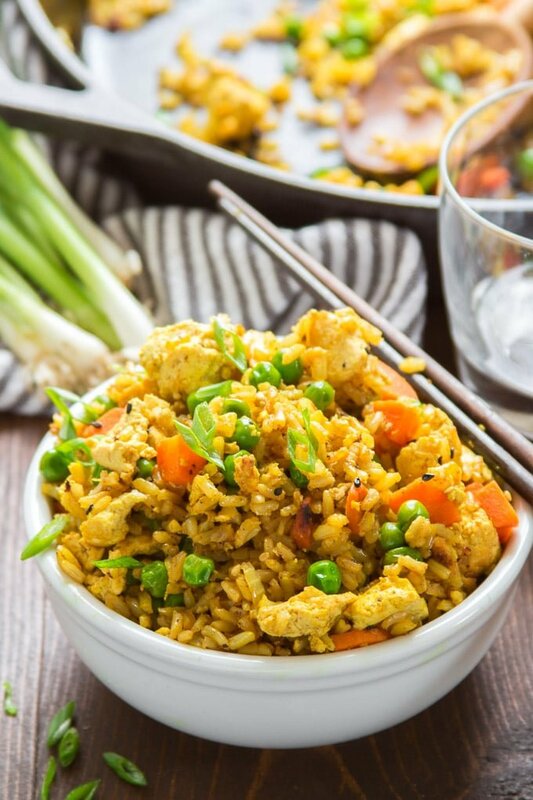 Dress your fried rice with some scallions and sesame seeds, and enjoy! Not into tofu? Feel free to leave it out. You may need to cut back on the sauce by a smidge. Don’t like peas and carrots? Substitute your favorite stir-fry veggies! Just keep in mind that harder veggies need longer to cook and should be added earlier (like the carrots), while softer veggies can go in later. Want to make this recipe gluten-free? Substitute gluten-free tamari for the soy sauce. This recipe gives you a range of how much curry powder to use. The amount you use will vary, depending on personal preference and what brand you use. Whatever you do, be sure to choose a good quality brand of curry powder with flavors that you enjoy. 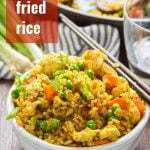 What kind of rice works best for fried rice? It doesn’t really matter! Any variety of rice that’s grainy (so no risotto), and cooked well (not one of those sad batches of brown rice that came out mushy), should work just fine. I generally go for jasmine or short grain brown rice. Since you’re using leftover rice for this dish, be sure to take proper food safety measures to avoid spoilage. Refrigerate your rice within 2 hours of cooking it and don’t use rice that’s more than 3-4 days old. Stir the soy sauce, vinegar, garlic, ginger, curry powder and turmeric together in a small bowl. Set it aside. Coat the bottom of a large nonstick skillet or wok with oil and place it over medium-high heat. When the oil is hot, break the tofu into medium to large chunks and add them to the pan. Cook the tofu for about 5 minutes, flipping occasionally with a spatula, until it begins to brown and crisp in spots. Push the tofu to the sides of the pan, away from the heat. Add the onion and carrots to the center of the pan, and sauté them for about 4 minutes, until the carrots become tender-crisp and the onion begins to brown. Turn up the heat to high. Give the pan a minute to heat up, then add the rice and sauce. Flip everything to mix the ingredients, the stir-fry, flipping rapidly, until the rice begins to dry out and crisp up, about 5 minutes. You can break the tofu up into smaller chunks at this stage, if desired. Add the peas and flip a few times to incorporate. Sprinkle the fried rice with sesame seeds and scallions. Serve. This certainly looks like a bowl of deliciousness! 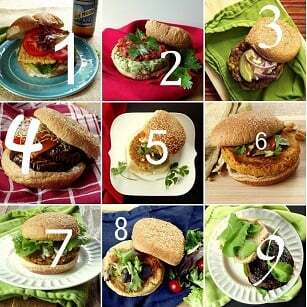 I’d be honored if you shared this recipe (and any others) at our What’s for Dinner link party! Thanks Helen! I’ll check it out!